Early on Wednesday morning, TAB members took 50 students from Tuxedo Park School on a trail hike to teach them how to identify native and invasive plants. Trees were planted at the School and at the Race Track Nature Preserve to celebrate Earth Week and Arbor Day. September 30, 2017 was a very busy day that began early with a Bird Walk at the Race Track Nature Preserve. Click here for the list of birds sighted. 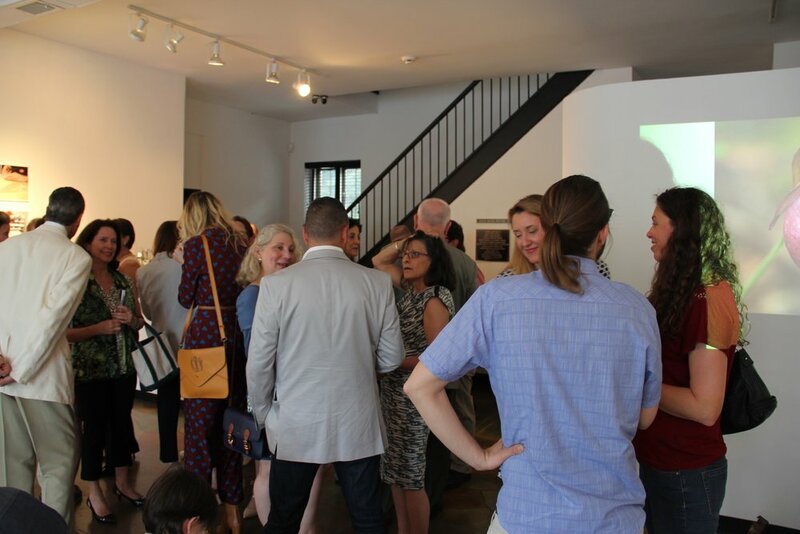 + A community party in Tuxedo launches Mae Shore’s woodblock print. Read more. 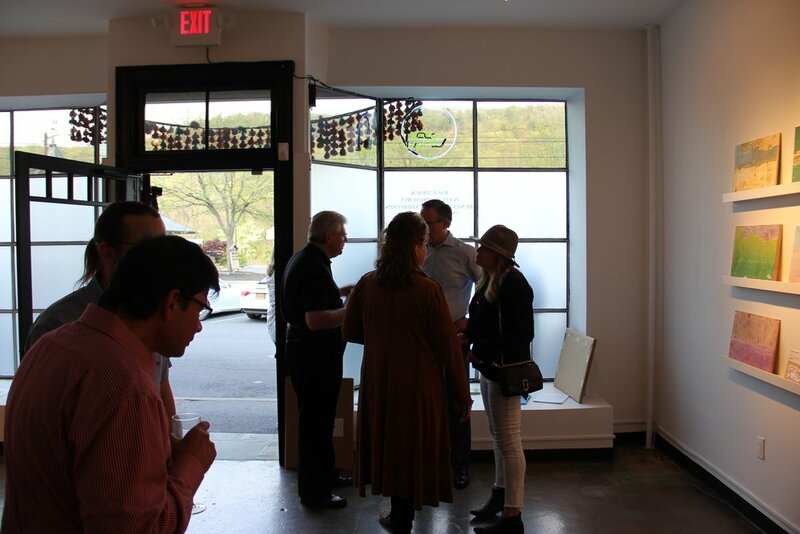 On April 29, 2017, Mae Shore’s limited-edition print was launched to an enthusiastic gathering at the Cheymore Gallery, Tuxedo Square, Town of Tuxedo. The multi-media exhibition included photos of Mae at work, carved woodblocks showing the stages of color printing, a slide show of historical and contemporary images of the Race Track, antique relics found on site, and a map created by Larry Weaner Landscape Associates showing the different natural habitat zones of the basin. 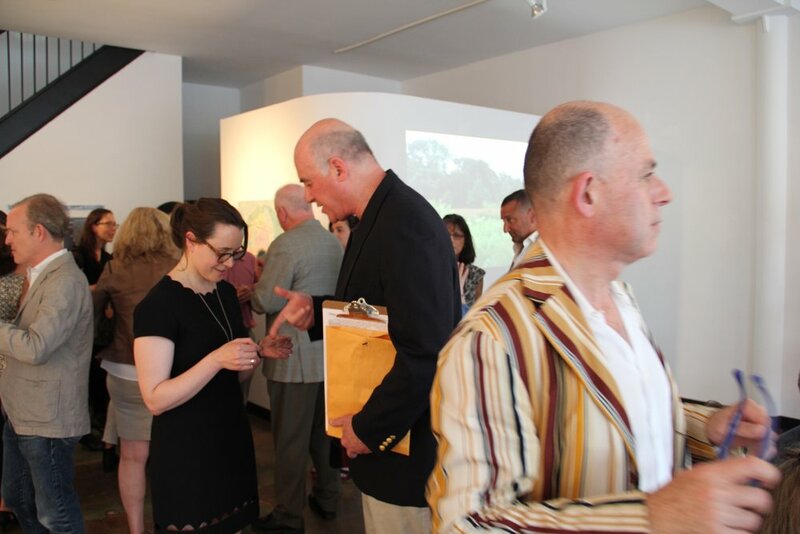 + A party in New York City launches Mae Shore’s benefit print. Read more. 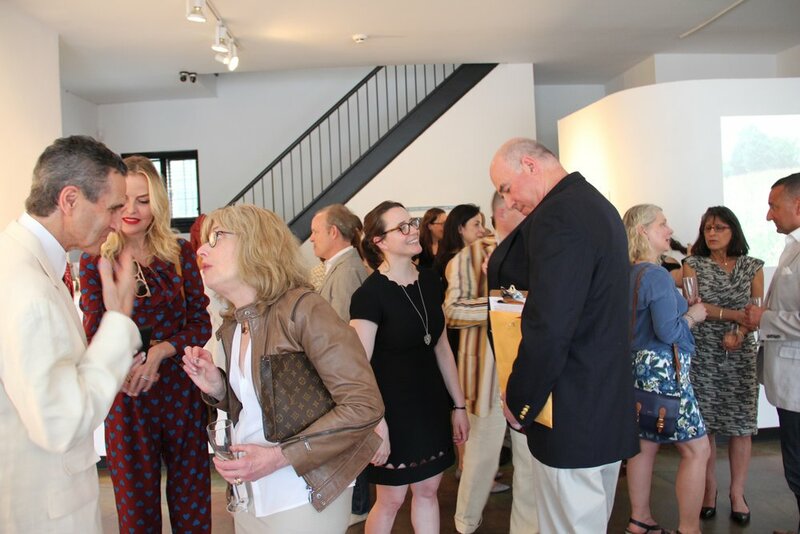 On May 10, 2017 in New York City, Mae Shore’s print was launched with the same multi-media presentation at the Blumka Gallery, by the generous courtesy of Lois and Tony Blumka. + Tuxedo Park celebrates Arbor Day on April 29, 2017. Read more. On April 29, the community celebrated 2017 Arbor Day. More than 80 residents and guests attended the Ceremony at the Race Track Nature Preserve. 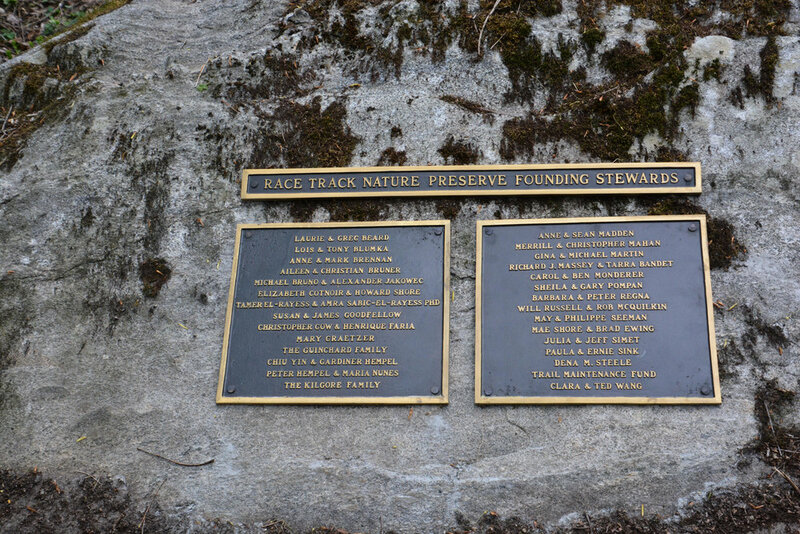 We unveiled the bronze plaques commemorating the extraordinary generosity of the Race Track Nature Preserve Founding Stewards – 29 residents/families who donated a significant sum to enable us to hire the renowned natural-area design firm, Larry Weaner Landscape Associates and to begin the first stages of restoration work at the Preserve. We presented the 2017 Arbor Day Award to John C. Yrizarry, who spent more than ten years observing flora and fauna at the Race Track. 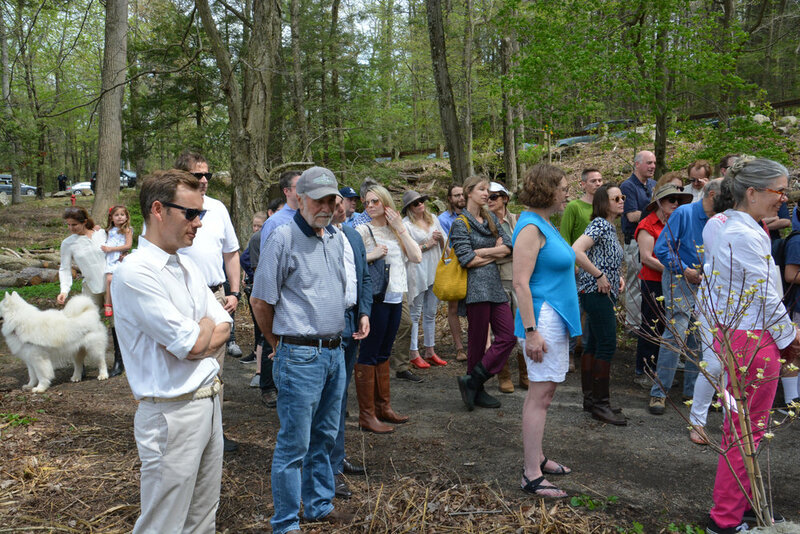 The data he gathered, his enthusiasm and his advocacy were instrumental in the Village Board of Trustees’ unanimous votes in August 2016 to allow the transformation of this 21-acre basin into a community nature preserve. A tulip tree will be planted in John’s honor at the northern end of the Race Track near the planned new entrance, along with 2 flowering dogwoods and six shade-loving gray dogwood bushes in other locations of the basin. On December 21, 2016, TPTAB presented to the Board of Trustees at its regular meeting a review of TPTAB's work/achievements since its establishment in January 2016. + On October 24, 2016 a team of Tree Advisory Board members, Garden Club and other volunteers, and DPW staff planted 108 trees and shrubs on the East Lake Road embankment to help counter the severe milfoil infestation at the southern end of Tuxedo Lake. The Village has taken steps to harvest the plants and to install a barrier. Planting a “riparian vegetative buffer” at the southern bank is meant to work in tandem with these other remedial measures. In time, a mature vegetative barrier will help reduce storm water runoff from the adjacent steep hill (which has little undergrowth to absorb/process the runoff), across East Lake Road and the embankment slope, into our reservoir. Storm water carries nutrients (fertilizers), pollutants and sediments into the water. These chemicals/substances encourage the growth of aquatic invasive plants, particularly where the water is still and not well aerated. Milfoil reproduces extremely rapidly and can infest an entire lake within two years of introduction to the system. Milfoil drastically degrades the ecology of a body of water. It forms very dense mats of vegetation on the surface. These mats harm the quality of the water – in our case, it is our drinking water. They interfere with water intake for household supply and for fire hydrants. They impede the recreational activities permitted on Tuxedo Lake. The sheer mass of plants can cause flooding in shallower areas and the stagnant mats can create a good habitat for mosquitoes. Milfoil mats rob oxygen from the water by preventing the wind from mixing the oxygenated surface waters to deeper water, thus harming fish and other aquatic life. The dense mats can also increase the sedimentation rate by trapping sediments. 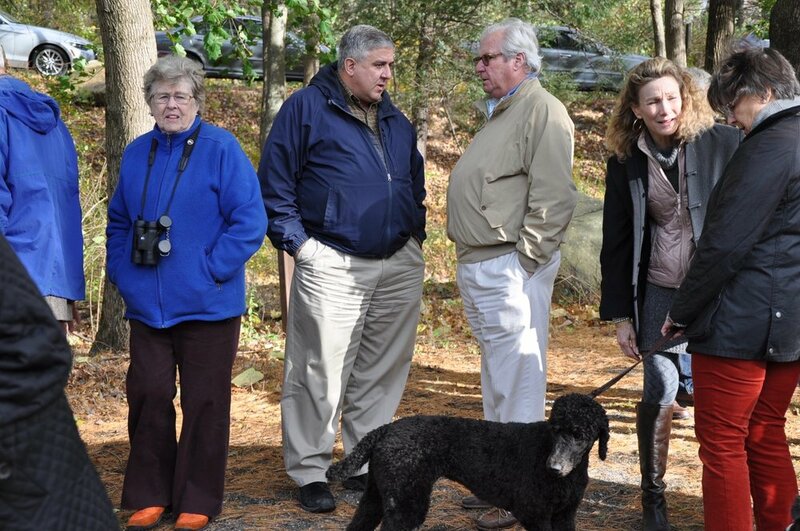 + On October 23, 2016, following the much needed rain the day before, blue sky and an invigorating breeze greeted the sixty plus residents and guests (and their pets) at the Official Dedication Ceremony for the Race Track Nature Preserve. Mayor Mary Jo Guinchard, Deputy Mayor Claudio Guazzoni and Trustee John Moon were present at the Dedication Ceremony. They were joined by more than sixty residents and guests (and their pets). 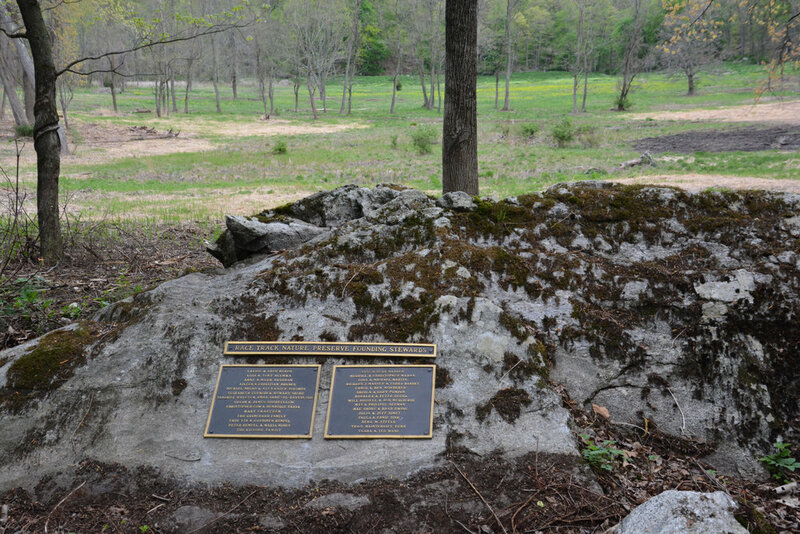 Mayor Guinchard unveiled the bronze dedication plaque mounted onto a giant boulder. She thanked the attendees and praised the teamwork and support of many people who had made possible this worthy environmental initiative. Chiu Yin Hempel, Chair of the Tree Advisory Board, gave special thanks to Jeff Voss and the DPW who shouldered much of the hard physical work of preparing the site for the Ceremony, and to Building Inspector John Ledwith and Deputy Clerk Debbie Matthews who provided administrative support. She acknowledged in particular Dena Steele, who had the vision to recognize the value of the Race Track as a nature preserve long before anyone else paid it attention. For more than ten years, Dena, using her own resources, exercised stewardship care of this natural basin. She financed an environmental report and inventory studies for trees and wild flowers. She paid for the design and creation of the circular walking trail and its continued mowing until the DPW took over the work this spring. Dena even bought 100 pounds of wild flower seeds for some $5,000 and sowed them herself at the site of the former tree refuse dump with the help of a few friends and her husband. Dena also introduced naturalist, John Yrizarry to the Race Track. Mr. Yrizarry then spent a decade observing and documenting its flora and fauna. The scientific data thus gathered formed the basis of the illustrated book, Tuxedo Park: The Gift of Nature, published by Carol Monderer Publishing for the benefit of local non-profit organizations. The stunning photography by Greg Miller brought home the beauty of our Village’s landscape. This heightened awareness of our precious natural environment in turn encouraged the Board of Trustees to set up the Tree Advisory Board and to permit the transformation of the Race Track into a Preserve. Dena is now a critical member of the Tree Advisory Board. Her Tree Board colleagues then presented her with a gift to thank her for her vision and stewardship. Carol Monderer, 2016 Chair, Friends of the Race Track Nature Preserve thanked the Founding Stewards. Their generous donations have enabled the Village to engage Larry Weaner Landscape Associates to prepare the master restoration plan, and to move straight into the first phase of the implementation work in Spring 2017. She emphasized that this multi-year project will require much more funding, and donations at any level is welcome. Anyone interested in making a contribution should contact her racetrackfriends@gmail.com or any member of the Tree Advisory Board. Christopher Gow, Member of the tree Advisory Board, thanked the Deviners. This 10-person strong group of volunteers has been working very Saturday (weather permitting) on Village-owned land to free trees from strangling vines. More volunteers, Christopher noted, are welcome and needed – because they have to staff up a spin-off group, the Deweeders, to tackle invasive weeds. He also thanked the Garden Club for organizing the walking tour after the official Ceremony. Penn Marchaels, designer from Larry Weaner Landscape Associates, spoke about their credentials in restoring meadows and natural areas. They have completed a large number of projects for municipal and state organizations, as well as high net worth families. He expressed his firm’s enthusiasm in working on this unique site comprising multiple natural habitats: meadow, forest, swamp and wetland. Following the unveiling Ceremony and speeches, conversations over cider, pretzel and organic apples – served by Caio and Luca Rodolfo – were enjoyed by all. Many participants took the walking tour. + In May 2016, 150 trees and shrubs were planted at Augusta Brook! As a continuation of the 2016 Arbor Day Celebration, on May 2, TPTAB, assisted by the DPW and Garden Club members, planted 150 trees and shrubs along Augusta Brook on the left side of Tuxedo Road. The plants were gifted to us by the NYS Department of Environmental Conservation (DEC) under their Trees for Tribs Program. A huge thank you to Beth Roessler and her colleagues of the DEC for accepting our application to the Program, delivering the plants and helping us with the planting! + 2016 April 30 Arbor Day celebration a huge sucess! 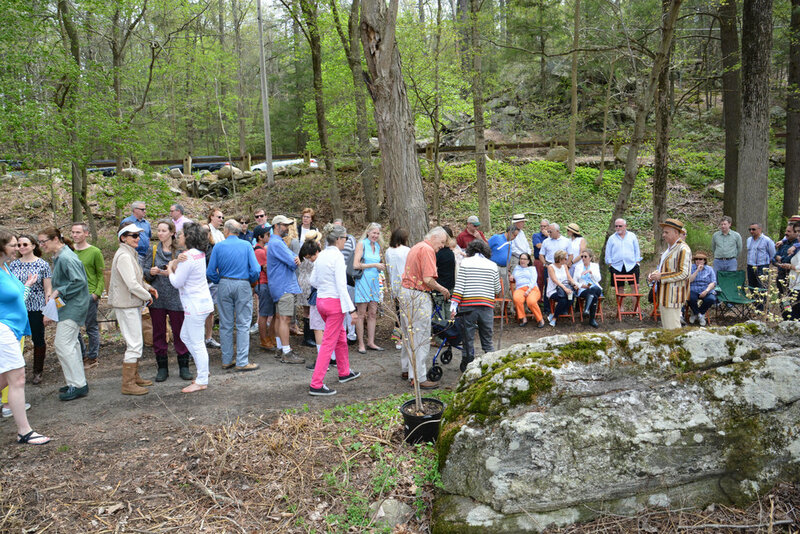 More than 100 residents, both adults and children, gathered at the house of Mayor Mary Jo Guinchard and her husband Claude on April 30 to celebrate Arbor Day. TPTAB members shared information about the importance of planting trees and shrubs to replenish our aging forest and to keep our drinking water from the Tuxedo Lake (our reservoir) clean. The 2016 Arbor Day Award recognizing exemplary environmental stewardship was presented to Dena M. Steele and the Honorable Houston A. Stebbins. An American Beech tree was planted on May 2 in their honor in front of the Village Building to the left of the Keep. The Deviners were specially thanked for their hard labor removing invasive vines that have been strangling trees and plants on Village land. Students from the George Grant Mason Elementary and Middle School sang “Trees”, the poem by Joyce Kilmer beautifully set to music. Garden Club members demonstrated tree planting and composting. Assemblyman Karl Brabenec judged the children’s tree drawings competition and presented the awards to the winners: Eliza Vaught (First Place), Maddie Nicholson (First Runner-up), Zoe Vaught (Second Runner-up), Tate Sink (Honorable Mention). Their drawings are now being exhibited at the Village Hall. The TPTAB thanks the many volunteers and donors for their generous support of Tuxedo Park’s first Arbor Day Celebration. 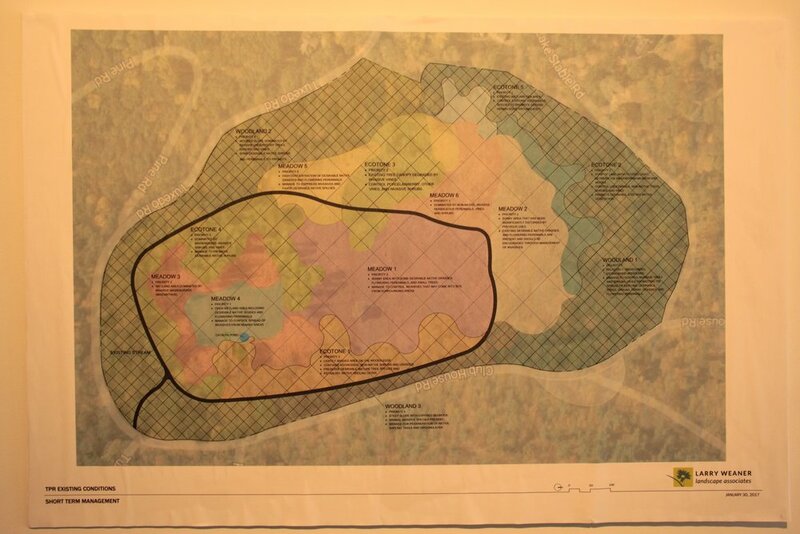 On April 8 2017, Larry Weaner Landscape Associates, the renowned natural area landscape firm chosen in an open bid process to transform the Race Track into a community Nature Preserve, presented their vision, strategy and methodology. More than sixty residents attended the open meeting. Listen to the presentation and Q&A here. + Guided tour of the Race Track Nature Preserve available every Saturday. Going forward, each Saturday at 2 PM, (weather permitting) a member of the Tree Advisory Board will be at the Race Track to give a guided tour. Come join us, learn about the history of this 21-acre valley, its biodiversity and our exciting transformation plan. To ensure the Preserve remains a place where we can have the unique experience and pleasure of being surrounded by nature, we need to protect the native wildlife and flora, and conserve the distinctive habitats identified by environmentalist Spider Barbour: different types of meadows; swamp, marsh and seasonal wetland; and forest. We must strive to produce long-term benefits to wildlife and promote native biodiversity, in accordance with sound and generally-accepted soil and water conservation methods. + Tom Garbett has joined the Deviners, making the group of volunteers 13-person strong. Tom has brought with him mechanical advantage and additional manpower. He made available his versatile mini bucket truck which enabled access to strangling vines at the top of trees along the circular path at the Race Track Nature Preserve. He also deployed two of his firm’s employees to help with the work. Gardiner Hempel and Christopher Gow joined in their Herculean efforts. See photos below of their incredible work! The trees on the south side of the Preserve (along Tuxedo Road) are now largely freed of killer vines. But much work remains at the Race Track, along Tuxedo Road and at the Eastern Causeway, and the Deviners will soldier on. The Deviners are: Stephen Brodheim, Elizabeth Cotnoir, Tom Garbett, Christopher Gow (Tree Advisory Board liaison), Mike Granito, Gardiner Hempel, E. J. Mathews, James Oberle, David du Pont, May Seeman, Penny Spangler. We have two teenage recruits: Caio and Luca Rodolfo, who have been removing Japanese Stiltgrass (an invasive weed) along Clubhouse Road. The group even has a junior member, but he won’t be deployed until he is older! More volunteers are welcome! Bring your own gloves, clippers and protective gear. This will be a weekly endeavor until the work of removing killer vines that are strangling trees on Village-owned land is done! The Deviners meet every Saturday at Dottie Audrey's between 12.30 to 1.00 PM (Sunday, same time, is the rain date) for a quick lunch and to plan the attack. The Deviners usually work until 3:30 PM. Email the Deviners if you have any questions or if you wish to join. Eight very large dead trees (some covered in pernicious vines) along Tuxedo Road have been removed by a professional tree company. We also trimmed the dead branches off a beautiful willow tree near the entrance of the Park. The DPW has also removed some dead/fallen trees at the south end of Tuxedo Lake. We have flagged other potentially hazardous, dead/fallen trees along Tuxedo Road that will, over time, be removed by either the DPW or by a tree company. But we are leaving sufficient dead wood for storm water control, soil restoration and animal shelter! Compete for the “Nature Photo of the Month”! Submit by email photos of interesting trees/beautiful landscapes in Tuxedo Park by the 25th of each month. The winner’s photo will be posted on the home page of this website the following month! Please see the submission guidelines.